Anybody shopping for gold jewelry will quickly find that one of the most important components of a piece of jewelry’s description is its karat value. Gold jewelry can typically be found in 18-karat, 14-karat and 9-karat forms in the United States. Other countries sometimes carry gold jewelry in 22-karat and 10-karat forms as well. Karats are used to measure the purity of gold in jewelry. Completely pure gold is considered to be 24 karats, and gold jewelry marked with any number less than 24 has only that many parts of gold, with the remainder comprised of other metals known as alloys. 18-karat gold is 18 parts gold to 6 parts alloys, or 75 percent gold. 14-karat gold is 14 parts gold to 10 parts alloys, or 58.3 percent gold. 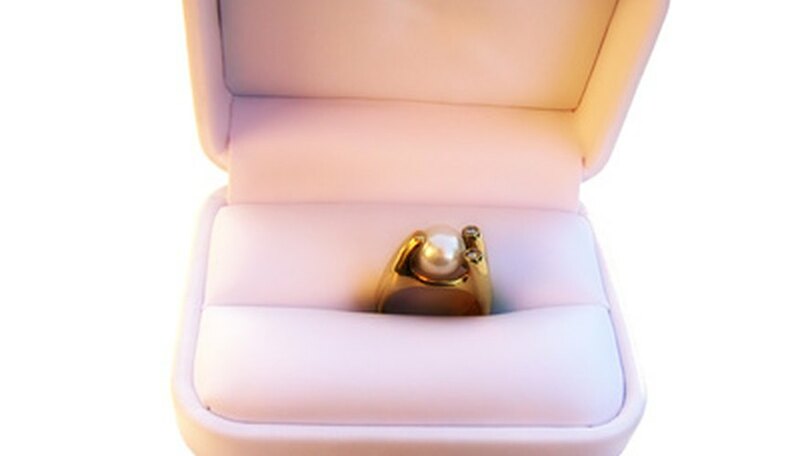 Both 14-karat and 18-karat gold are commonly used to make men’s and women’s rings and women’s fine jewelry such as earrings, necklaces and bracelets. Gold jewelry typically contains 18-karat or 14-karat gold because 24-karat gold is too soft and shows signs of wear far sooner than jewelry made of gold mixed with other metals. Eighteen-karat gold is more expensive to purchase than 14-karat gold because of its higher content of gold. The cost difference is not necessarily proportional to the amount of gold in the jewelry because other factors such as the design of the jewelry also affect the price. Because men’s rings are typically larger and heavier than women’s, many couples choose to purchase a man’s ring made with 14-karat gold or even 9-karat gold because they are less expensive than 18-karat gold. The cost difference on a woman’s ring is not as significant because it contains less metal. Pure gold is softer than the alloys used to make 14-karat and 18-karat gold jewelry. The main purpose of the alloy is to make the jewelry harder and more durable. Because 14-karat gold contains a higher percentage of an alloy than 18-karat gold, it is slightly more durable to the wear and tear of general use. However, this difference is so small that many people consider it to be insignificant in practical terms. White gold, like yellow gold, comes in both 18-karat and 14-karat forms. White gold has alloys with a whiter color such as nickel and zinc mixed in with the pure gold. Because 14-karat white gold contains more of the white-colored alloys than 18-karat white gold, it is likely to appear whiter than 18-karat gold, which has a yellow tinge to it. However, both 18-karat and 14-karat white gold rings are typically plated with rhodium, a very white metal that hides the yellowish tint. May, Kristen. "14Kt Gold Vs. 18Kt Gold." Sciencing, https://sciencing.com/14kt-gold-vs-18kt-gold-6691874.html. 24 April 2017.